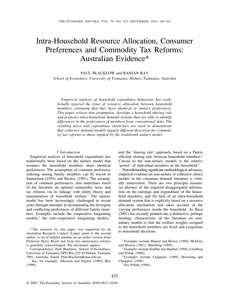 Empirical analysis of household expenditure behaviour has traditionally ignored the issue of resource allocation between household members, assuming that they have identical or unitary preferences. This paper relaxes that assumption, develops a household sharing rule and proposes intra-household demand systems that are able to identify differences in the preferences of members from conventional data. The resulting price and expenditure elasticities are used to demonstrate that collective demand models suggest different directions for commodity tax reforms to those implied by the traditional unitary model.